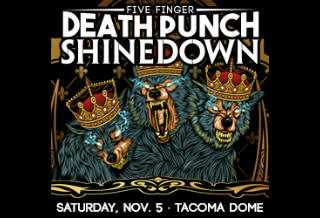 Five Finger Death Punch and Shinedown are partnering to co-headline the biggest Fall Arena Rock Tour of 2016 produced by Frank Productions/NS2/CMoore Live. The tour is also highlighted by Special Guest SIXX:A.M. featuring vocalist/producer James Michael, bassist Nikki Sixx and guitarist Dj Ashba. UK newcomers As Lions, featuring Austin Dickinson, will round out the supporting lineup. Says Five Finger Death Punch guitarist Zoltan Bathory about the tour: "I wanted to give you a brilliant quote about trying to keep rock music alive by assembling bills that can sell out arenas where everyone can have the production rock shows deserve, or bringing out new talented bands and expose them to huge crowds... or about rebuilding a community with the help of rock radio, and donating to good causes while we are at it… but we are so busy doing it that I ran out of quotes.” “Shinedown has always been about sharing the undeniable power of rock music,” says Shinedown frontman Brent Smith. “Five Finger Death Punch shares that passion and commitment, and, like us, leaves it all out on the stage every single night. 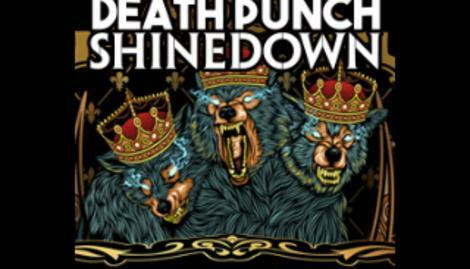 Come experience the power of rock music with us.” “We are really excited and proud to be part of this tour with FFDP and Shinedown. Having spent many months in the studio recording Prayers for the Damned, it will give us the opportunity to play our new songs and hits in arenas,” says bassist Nikki Sixx. The bands have partnered to donate $1 from each ticket sold on the tour to four hand-picked charitable organizations close to their hearts, as well as teaming up with Crowdrise to give fans a chance to win VIP tickets plus a Meet & Greet by choosing to donate $5 at the time of purchase.